Pathfinder Tours The Maybach Meanderer from Crewe to Crewe via Quainton Road. 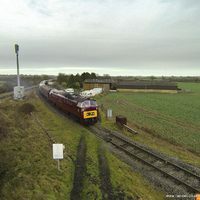 Using the Diesel Traction Groups D1015 Western Champion for motive power through out we catch up with the tour in Buckinhamshire. D1015 slows on the approach to Claydon Junction. Seen here passing Portway Farm, Charndon. D1015 runs round it's train at Claydon Junction. D1015 departs Claydon Junction bound for Quainton Road with Pathfinder's 'Maybach Meanderer'. Shot taken on private land with the land owners permission. Departing Claydon Junction D1015 heads south towards Quainton Road. Shot taken with landowners permission. Whist the passengers enjoy the Buckinghamshire Railway center D1015 sits around for all to see. Approaching Marsh Lane crossing D1015 heads along the Aylesbury to Princes Risborough line.